The Rise, the latest venture from Yorkshire's only five-star hotel has welcomed a brand-new Bars Manager and Restaurant Manager to oversee the 130 cover restaurant. After opening in June 2017, The Rise is delighted to welcome their new Bars Manager, Alexandra Chlistalla, joining The Rise from the iconic 5-star hotel, Shangri-La at The Shard in London. Chlistalla began her hospitality career in Munich, Germany undertaking a three-and-a-half-year internship with Marriot, where she discovered her passion for creating high-end food and beverage experiences. Alexandra Chlistalla, said: "I love to create unique experiences for my customers. It's very important for our guests to walk into a beautiful building and to be greeted with equally beautiful food and drink. "I'm always experimenting with new food and beverage trends and I'm thrilled the team at The Rise share this vision. It's a privilege to be working with such a dedicated and hard-working team." Darren Noyland joins The Rise as Restaurant Manager with twenty-three years of industry experience spanning across restaurants such as Smoke, Las Iguanas, and Brewhouse & Kitchen. 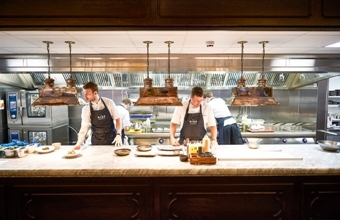 Noyland commented: "I love the sharing style of the food at The Rise, it's something I'm truly passionate about and I believe our Executive Chef, Craig Atchinson, has created a fantastically unique menu for our guests to enjoy. I'm also passionate about people. I love to help and develop individuals, watching people grow and learning the tricks of the trade." Philip Bolson, General Manager of The Grand Hotel & Spa, York said: "We're thrilled to have appointed both Alexandra and Darren. We believe they will generate brilliant results for The Rise driven by their dedication and passion for great food and drink, and creating unique, high-end experiences". The Grand Hotel & Spa, York is currently undertaking a £15 million re-development, with The Rise at the heart of its plans. The expansion project will also see the addition of 101 bedrooms when a new accommodation wing opens later this year. When complete, the development will double the number of five-star rooms in York, from 107 to 208, generating an additional £1.7 million of annual visitor expenditure for the local economy. To book your table at The Rise, please visit https://theriseyork.co.uk/ or call 01904 380 045.